Whenever I go to a donut shop, I feel like I always lean toward getting an apple fritter. Why? Well, not only are they delicious, but there’s something really unique about them. Fruity, fried, crunchy, and soft all in one, apple fritters give you everything you could possibly want out of a dessert, and for that, I thank them… and I make them. Since it’s fall, it’s apple season, so apple fritters are at the top of my food list. Apple fritters are great on their own, but is there any way to make them better? The answer is yes, and the answer is Fireball Cinnamon Whisky. For the rest of the ingredients, click here. Whisk together the flour, milk, Fireball, egg, baking powder, cinnamon, and salt. This will create your fritter batter. Dip sliced apple into that batter, then fry. For details on the perfect type of apple as well as temperature and length of frying, click here. 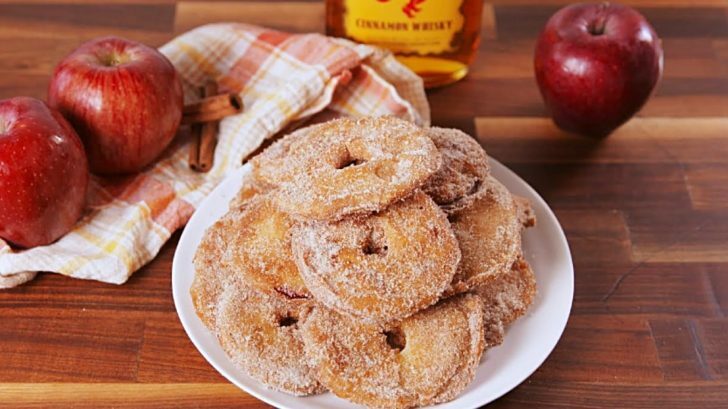 Once you try these, you won’t make apple fritters any other way.